Total Interior is the one product that cleans and protects virtually any car interior surface! Simply mist and wipe for professional cleaning results everywhere, from the dashboard to glass and more! Rather than use separate cleaners for leather, vinyl, plastic, carpet, cloth, glass, and wood, Chemical Guys developed Total Interior. 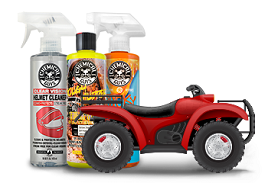 With just one product, you can now clean and protect virtually all interior surfaces to remove layers of dirt, grime, debris, fingerprints, grease, and oils. The gentle formula won’t stain, streak on glass, or change the feel or texture of upholstery or carpets. 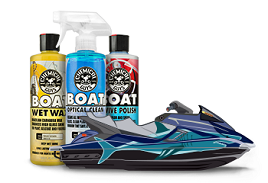 The unique formula is also blended with UV blockers that help shield interior car parts from harsh sunlight to help prevent cracking and fading on hard plastics. The premium formula wipes clean, finishes residue free, and leaves no greasy or oily feel or look behind. Total Interior Cleaner does not add extra gloss or shine; it only restores the stock appearance to the cleaned part. Always test surface area first. Spray Total Interior Cleaner & Protectant on dirty surfaces. Wipe up dirt, grime, and contamination with a microfiber towel or agitate filth from cloth, carpet, or upholstery with a soft brush. Buff away streaks or blot fabrics dry and with a separate clean microfiber towel. 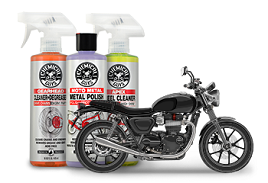 Mist product directly into cleaning towel to avoid overspray.